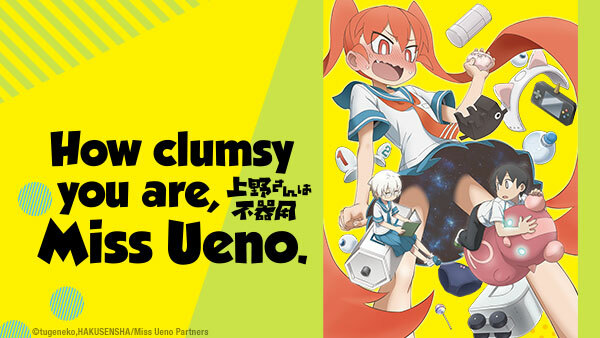 Sign up now to stream How Clumsy you are, Miss Ueno., subs, tons of dubs, OVA's, simulcasts, plus the all new Dubcast℠ editions and more! Will the truth finally come out thanks to a sleeping pill? Later, Tanaka’s sisters stop by for a visit! Tanaka is very oblivious when it comes to love. That said, Ueno's methods can safely be described as extremely unconventional. Can Tanaka tell the difference between Ueno and a robot? Later, Ueno uses her scientific prowess to create life! Ueno investigates mysterious rumors as a ploy to bond with Tanaka. Later, a revolutionary water filtration system involves super absorbent gym clothes. Is Tanaka so hungry he’d be willing to eat anything? Afterwards, this toy capsule vending machine dispenses unconventional items. Can Ueno use tights to charge a cell phone? She seems to have found a way! She also has an idea regarding a new use for swimsuits. A cute accessory is actually an alarm system in disguise. Sometime later, Ueno’s next creation unexpectedly leads to inquiries regarding leg hair. Chairs are now obsolete forever! That is if Ueno would only consider the practical applications of her invention. Later on, the Tennis Club needs Ueno’s help. Tanaka, you really need to stop and think about what comes out of your mouth. Later, Ueno creates a device that shares sensory experiences? ...It’s gonna backfire, isn’t it?